Pregnancy and delivery are pleasant physiological phenomena, but at times, changes occur in pregnant women's mood that make them so sensitive to psychological stimulants and lead to their mental problems. , After delivery, women start losing self-control on the events and feel helpless, and are involved in confusion and manifest signs such as depression, anxiety, and posttraumatic stress disorder. Modares et al. reported the prevalence of stress disorder as 20%, while after a traumatic delivery, it was 37.7%. Post delivery anxiety influences 5-20% of the mothers. Eventually Postpartum depression (with a variant prevalence of 5-40% in different societies) accounts for 12.5% of the women's hospital admissions due to psychological problems. Postpartum depression is among the most important complications of postpartum stress, which increases mothers' and infants' vulnerability. Stress can lead to anxiety which is a mental reaction to a real or mentally made threat. Lack of sleep, poor nutrition, high consumption of caffeine, smoking, and physical diseases are among the manifestations of anxiety. Anxiety in mothers decreases oxytocin secretion and milk production. A study in Japan showed that postpartum anxiety and depression led to lower self-confidence and, consequently, decreased breast feeding. Although minor anxiety can somehow encourage the individuals to take charge of their responsibility properly or to learn how to modify their lifestyle and habits, severe anxiety can be very disabling. Anxiety increasing as much as a panic disorder can cause disability. Postpartum depression can have negative effects on mothers' role and, in some cases, impair maternal interest to infant and family members. As birth is considered a pleasant event, mothers' mental suffering can be very confusing for the family members. It also negatively affects their sexual desire and, consequently, their marital relationship. Postpartum depression is a major health problem that impairs healthy mother-infant relationship. If not treated, depression gradually subsides normally 6 months after delivery, while a longer period of time increases the number of complications and their severity. The first step in treatment of such disorders is prevention. Recent studies show that treatment interventions before and after delivery act very successfully in reduction of risk among the women with severe delivery-related disorders. Preventive treatments during delivery and immediately after that include supportive psychotherapy, interpersonal psychotherapy, and medication. Prophylactic medication is recommended for high-risk mothers immediately after delivery. Since use of psychotropic drugs by breast feeding mothers causes problems such as severe drowsiness and diminished response of mothers to the cries of infants during sleep, changes in sexual function, fatigue, changes in role, confusion, hypotension, tachycardia, etc., and also due to their tranquilizing effect on the infant through the milk they receive, these medications are limited during breast feeding. Research shows that one of the existing treatments to reduce stress, anxiety, and depression is aromatherapy. , Sahebalzamin et al. reported that aromatherapy inhalation of lavender and rose essence combination significantly decreased the level of anxiety and depression among the students residing in hostels. A significant decrease in cortisol release from the adrenal gland, a significant increase in secretion of serotonin from the digestive system, and a significant reduction of anxiety during delivery have been all reported after inhalation of lavender in Mirzaei et al. 's study. Pemberton and Turpin reported the effect of lavender and sage on the reduction of stress resulting from working in ICU among the nurses. There are some studies on aromatherapy in postpartum period, including Imura et al. in which mothers' and infants' physical and mental status improvement and facilitation of mother-infant interaction have been reported. Conrad and Adams conducted a comparative study on the effects of inhalation and massage aromatherapy using a combination of lavender rose essentials and reported that both methods significantly reduced depression and anxiety although massage aromatherapy was more effective. One of the scented essential oils used in aromatherapy is lavender oil. Its scientific name is Lavandula angustifolia from the group of mints with the English name of lavender. Among the effective ingredients is a combination of linalool and linalyl acetate. Linalool acts as a tranquilizer by affecting aminobutyric acid receptors in the central nervous system. Oil essence of this plant contains phenol aldehyde or alcohol with the highest germicidal effect. With regard to the high prevalence of stress, anxiety, and postpartum depression and lack of adequate research on the effect of inhalation aromatherapy on prevention of stress, anxiety, and postpartum depression, the present study aimed to investigate the effect of lavender on the prevention of stress, anxiety, and postpartum depression in women. This is a clinical trial (No. 392556) that was conducted after obtaining permission from the ethics committee of Isfahan and Lorestan universities of medical sciences. 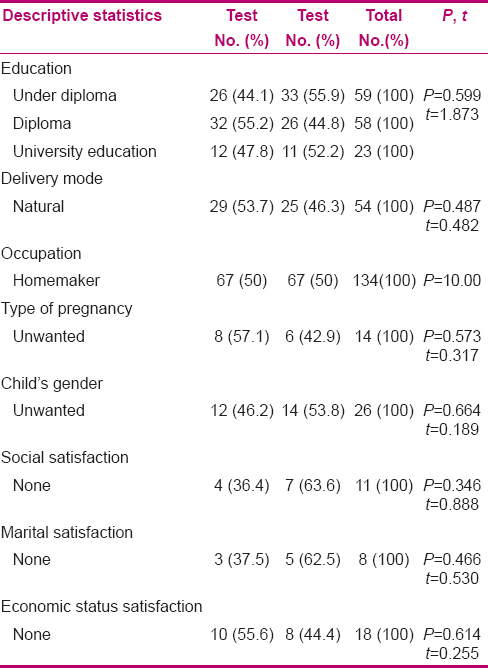 In this study (2014), 171 women hospitalized in the midwifery and gynecology ward of Charity Hospital of Asali in Khorramabad, Iran were selected through convenient sampling based on the inclusion criteria after delivery and they were explained about Golkaran the goals of study and asked to sign a written consent form. Inclusion criteria were being literate, having Iranian nationality, a single tone pregnancy, termination of pregnancy between 37 and 42 weeks of gestational age, birth of a healthy infant, no postpartum complications such as acute hemorrhage and infection, no maternal problems such as preeclampsia during their current pregnancy, no congenital abnormality in infants or not being hospitalized in ICU, no drugs or alcohol consumption by the mother, mother not being affected by known chronic or systemic diseases, no consumption of anti-depressant, anti-anxiety, or anti-stress medications in their recent pregnancy, no history of asthma, allergy, or dermatitis diagnosed by a physician, no history of eczema and allergy to flowers and plants diagnosed by a physician, and no disorder in olfactory sense. Exclusion criterion was appearance of signs of allergy to lavender essential in the subjects or their family members. Firstly, the subjects' background characteristics questionnaire was filled. Then, the subjects were randomly assigned to study (aromatherapy) and control (no aromatherapy) groups by picking up the cards of the related groups. In their study, Cronbach alpha values for the scale overall and the three subscales of depression, anxiety, and stress were reported as 0.93%, 0.88%, 0.82%, and 0.90%, respectively. Factor analysis also confirmed the subscales of depression, anxiety, and stress (each with seven items). Validity and reliability of DASS-21 have been frequently investigated and established. The resultant data of study were analayzed by SPSS19, ANOVA, Mann-Whitney, t-test, and post hoc tests. P < 0.05 was considered significant. In the present study, 140 women who were hospitalized in the maternity unit were studied after delivery. The background characteristics of both groups have been presented in [Table 1] (there was no significant difference in the background characteristics). Variance analysis results showed a significant difference in depression scores between the study and control groups at 2 weeks, 1 month, and 3 months after delivery (P < 0.0004). Mean score of depression was lower in the study group in different time points, compared to the control group (P < 0.0001) [Table 2]. Variance analysis results showed a significant difference in the mean scores of anxiety between the study and control groups at 2 weeks, 1 month, and 3 months after delivery (P < 0.0001). Mean scores of anxiety were lower in the study group in different time points, compared to the control group (P < 0.0001) [Table 2]. Variance analysis results showed a significant difference in the mean scores of stress between the study and control groups at 2 weeks, 1 month, and 3 months after delivery (P < 0.0001). It was less in the study group compared to control group (P < 0.0001) [Table 2]. As observed in [Table 3], Chi-square test showed a significant difference in the level of depression in the two groups of study and control at 2 weeks (P = 0.023), 1 month (P < 0.0001), and 3 months (P < 0.0001) after delivery. This study was conducted to investigate the effect of lavender on the prevention of stress, anxiety, and postpartum depression in women. The obtained results showed that mean differences of stress, anxiety, and postpartum depression scores and incidences of their signs were significantly lower at the time point of 2 weeks after delivery in the study group compared to the control group. Mean differences in the scores of stress, anxiety, and depression at time points of 1 month and 3 months after delivery were significantly different in the study and control groups; therefore, aromatherapy with lavender had a positive effect on reducing their signs. Mean scores of stress, anxiety, and postpartum depression had a higher reduction in the study group compared to control at 2 months after the intervention, indicating the longevity of lavender aromatherapy effect. Mean differences in the scores of stress, anxiety, and postpartum depression were significantly different at 2 weeks, 1 month, and 3 months after delivery between the study and control groups. Meanwhile, mean differences in the scores of stress, anxiety, and postpartum depression were different between the study and control groups at time points of 2 weeks, 1 month, and 3 months after delivery. So, the mean scores of stress and postpartum depression decreased through time in women after delivery. Therefore, although they normally decrease through time, this decrease was higher with lavender aromatherapy, which prevents or reduces the complications resulting from stress, anxiety, and postpartum depression. Our results are in line with Sahebalzamin et al., who reported a significant reduction of anxiety and depression of the students residing in a hostel after lavender and rose essential aromatherapy,  and Mirzaei et al., who reported a significant reduction in cortisol release from the adrenal gland, an increase in serotonin secretion from the digestive system, and reduction of anxiety level during delivery after aromatherapy with lavender. Our obtained results are also consistent with the study results of Imura et al. on the application of aromatherapy after delivery, reporting an improvement in mothers' and infants' physical and psychological conditions as well as facilitation of maternal-infant interaction,  and Conrad and Adams on the effect of inhalation and hand aromatherapies with a combination of lavender and rose essentials, in which hand massage aromatherapy was more effective. It should be noted that in all conducted researches, the goal was reduction of stress, anxiety, and diagnosed depression, while the present study was conducted to prevent these disorders and also investigate the longevity of aromatherapy, which had been ignored in previous studies. The present study faced limitations such as studying the subjects immediately after delivery. Especially those who have underwent CS, were reluctant to fill the psychological status questionnaire due to unappropriate physical and psychological conditions. The questionnaires were not also completed before intervention. In order to overcome this limitation and having two identical groups with regard to psychological conditions. Although the subjects were randomly selected and aromatherapy was conducted in two phases of "at home" and "in hospital," where the study and control subjects could be hospitalized on the beds next to each other and could distinguish the difference between lavender essential from placebo making a bias in the study, no intervention except routine care was administered in the control group. As inhalation of lavender can lead to prevention of stress, anxiety, and postpartum depression, it can be used as a complementary method to prevent these disorders. This article was derived from a master thesis of akram mansuori with project number 392556 Isfahan University of Medical Sciences, Isfahan, Iran. We appreciate Clinical Research Development Center of Charity Hospital Haji Karim Asli. We greatly appreciate the authorities of Isfahan University of Medical Sciences and the staff of Asali Charity Hospital, as well as all those who helped us in this research (No. 392556). Moshki M, Baloochi Beydikhti T, Cheravi K. The relationship of postpartum depression to health control beliefs and demographic factors. Zanjan Univ Med Sci J 2014;22:74-85. Korja R, Savonlahti E, Haataja L, Lapinleimu H, Manninen H, Piha J, et al. Attachment representations in mothers of preterm infant. Infant Behav Dev 2009;32:305-11. Gambel G, Creedy D, Moyle W, Webster J, McAllister M, Dickson P. Effectiveness of a counseling intervention after a traumatic childbirth: A randomized controlled trial. Birth 2005;32:11-9. Abedini Z, Soltani N, Mokhber N, Esmaeili H. Study of posttraumatic stress disorder in women with preeclampsia in differentiation of childbirth. IJOGI 2013;15:14-20. Azizi M, Lamyian M, Faghihzade S, Nematollahzade M. The effect of counseling on anxiety after traumatic childbirth in nulliparous women; a single blind randomized clinical trial. JKUMS 2010;14:219-27. Khorramirad A, Lotfi MM, Bidgoli AS. Prevalence of postpartum depression and related factors in Qom. PJ 2010;15:62-6. Craven RF, Hirnle CJ. Fundamentals of Nursing: Human Health and Function. 5 th ed.. Philadelphia: Lippincott, Wiliams and Wilkins; 2007. p. 1349. Nishioka E, Haruna M, Ota E, Matsuzaki M, Murayama R, Yoshimura K, et al. A prospective study of the relationship between breastfeeding and postpartum depressive symptoms appearing at 1-5 months after delivery. J Affect Disord 2011;133:553-9. Sahebalzamin M, Khanavi M, Alvi majd H, Mirkarimi S, Karimi M. Effects of inhalation aromatherapy on female students′ anxiety and depression settling in dormitory of Tehran University of Medical Sciences. IAU-TMUJ 2010;20:175-81. Santos IS, Matijasevich A, Tavares BF, da Cruz Lima AC, Riegel RE, Lopes BC. Comparing validity of Edinburgh scale and SRQ20 in screening for post-partum depression. Clin Pract Epidemiol Ment Health 2007;3:18. Alavi Majd H, Sadr S, Taghizade S, Nahidi F. Effects of Omega-3 fatty acids on postpartum depression. IJOGI 2012;14:24-31. Tiran D, Mack S. Complementary Therapies for Pregnancy and Childbirth. 1 st ed. Kangash Publication; 2000. p. 176. Conrad P, Adams C. The effects of clinical aromatherapy for anxiety and depression in the high risk postpartum women - a pilot study. Complement Ther Clin Pract 2012;18:164-8. Pemberton E, Turpin PG. The effect of essential oils on work-related stress in intensive care unit nurses. Holist Nurs Pract 2008;22:97-102. Imura M, Misao H, Ushijima H. The psychological effects of aromatherapy-massage in healthy postpartum mothers. J Midwifery Womens Health 2006;51:e21-7. Perry R, Terry R, Watson LK, Ernst E. Is lavender an anxiolytic drug? A systematic review of randomised clinical trials. Phytomedicine 2012;19:825-35. Vakilian K, Atarha M, Bekhradi R, Ghebleh F, Hatami Z, Ceraj A. The effect of lavender in care of postpartum episiotomy wounds. J Shahrekord Univ Med Sci 2008;10:63-9. Asghari Moghaddam M, Saed F, Dibajnia P, Zangeneh J. A preliminary validation of the depression, anxiety and stress scales (DASS) in non-clinical sample. cpap 2008;1:23-38.